The Cool Maker KumiKreator is a breakthrough way to braid beautiful friendship bracelets before your eyes! Drawing inspiration from the art of Japanese Kumi bracelets (Kumihimo in Japanese means “gathered threads”), the KumiKreator makes it easy to create stylish and intricate Kumi friendship bracelets. The KumiKreator DIY kit includes 88 spools of string and everything you need to make up to 10 unique bracelets! Select one of the stylish bracelet patterns from the design booklet, or create your own pattern! Next, choose from 5 different colors of string, load the ready-to-use spools into the machine following your bracelet design and spin to create! As you turn the handle, the spools dance around the machine, magically weaving your bracelet together in minutes! When your bracelet is finished braiding, remove it from the machine and customize with a stylish clasp – no knots are needed! Stack, wrap and share your bracelets with your BFF’s and mix and match to accessorize every outfit! Spin to create colorful friendship bracelets with the Cool Maker KumiKreator! EASILY SPIN TO CREATE: The Cool Maker KumiKreator is a breakthrough bracelet maker; it makes it so easy to create friendship bracelets without a single knot needed! Choose a bracelet design, load the machine with the colorful spools and spin to create! As you turn the handle, you’ll be mesmerized as the spools dance around the machine, magically weaving your bracelet together in minutes! 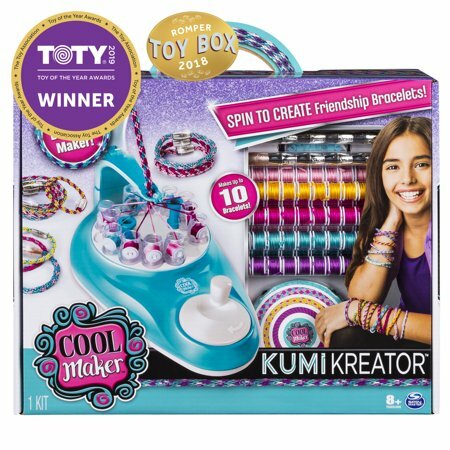 MAKE UP TO 10 BRACELETS: The Cool Maker KumiKreator includes everything you need to create up to 10 beautiful friendship bracelets, including: 88 ready-to-use string spools in 5 colors, a bracelet design booklet, stylish clasps to customize, a storage case and more! 88 PREMIUM SPOOLS: The KumiKreator’s 88 pre-loaded colorful spools of string easily pop into the machine and make every bracelet look beautiful! Choose to create 8 or 12-strand bracelets from the design booklet for different bracelet looks. Stack, wrap and share your Kumi bracelets with your BFF’s and mix and match with your outfits! The Cool Maker KumiKreator is a jewelry making kit for Cool Makers aged 8 and up. Spin to create beautiful friendship bracelets before your eyes and put the OMG in DIY! Cool Maker gives aspiring designers all the tools needed to make amazing creations they’ll be proud to share. Instructions: Wash hands with mild soap and water after use. I bought this for my daughterâs 10th birthday. The first one I bought the clip that holds the strings broke off the first time we used it but walmart was great in exchanging it with no problems. The set up is easy! And they also have youtube videos. She does need help setting up but maybe she will get the hang of it soon. The colors are super cute too. So for no issues of jamming. We have bought many braclet kits and the directions are too confusing this machine is sumple. Ordered for my 8 year old daughter for Christmas and she loves it. The bracelets come out pretty and just needs a little adult help for sizing and adding the clips at the ends. my only advice is to make sure you order refills along with it because if your child is anything like mine, they will use all the thread in one day making a bunch of bracelets. Better for ages 10 and up. Self feed spools would make this a much easier toy. Threading the machine can be difficult for any age. Watch the video with your child and help them the first time or two and they'll do great! *** Do not pull the threads up past the white top edge or it will tangle *** Spools should have more thread on them. My 2 girls love making friendship bracelets with cool maker kumikreator. Got one for each and one of them stopped working the first day. The handle to turn to make bracelets doesn't turn smoothly and if you force it can mess up spinners where string goes. Luckily i was able to fix it by taking it apart and putting it back together properly. Also a lot of string is wasted and can't be used since it won't be enough for another braceley. With the kumikreator I got two of them and both of them got jammed. It said on the paper if jammed look on cool maker.com and I did but it was very confusing and very fast. Missing 2 Spool holders. Can't make all bracelet patterns. Daughters a bit disappointed. Other patterns are cool. Hi there, thanks for taking your time to write this review on your KumiKreator. While we appreciate your feedback, we are really sorry to hear about your frustrating experience, our apologies. If you have any further questions or concerns, please give us a call (https://www.spinmaster.com/contact-us.php) and one of our live Customer Care agents will gladly help you out to the best of our abilities. 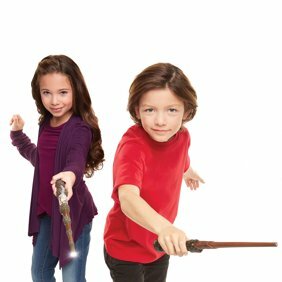 We want to do all we can to guarantee all our customers have the most positive experience with all our toys. Regards, Spin Master Customer Care. This product was number one on my daughters wish list! We tried so many times to get this to work. She became frustrated. When I sat with her, I understood why. This was a total waste! Bought this in October for Granddaughters for Christmas. Never opened until after Christmas. First time they used it was great! Beautiful bracelet. Next time was good, too. After that the spinners kept jamming, so no more bracelets could be made. Now, the spinner won't even pick up the spools to braid a bracelet. Don't know if I got the bad one in the bunch, but I've waited too long to be able to send back. Return date expired 12/15/18 - before we had even tried it!!! What a waste of money!! I'm glad it works for so many other people, but I would not recommend this to anyone!